Roller Blinds are used to cover the windows and are one of best option to decorate your windows. They look simple and yet stylish at the same time and adding onto that, they are usually used in both offices and homes because it is easy to use and install. It comes with vinyl attached by the side to help adjust the blinds. Nowadays, roller blind is a popular choice because it can be adjusted easily and is made of good material. 1. It is not very expensive as compared to blackout curtain or roman blinds. 2. With the simple design, it looks very neat. 3. Roller blinds come in different sizes and styles. 4. It helps to block out light and also heat, great for people who have unusual sleeping patterns. 5. With its simple design, roller blinds match well with almost any types of room decorations. 6. Rollers blinds are easy to clean and dry therefore, it is suitable for kitchen or even bathrooms. Roller blinds are made from different kinds of materials and these materials will then decide how much light is penetrating into your room. Usually those which blocks out more sunlight will be made of thicker materials. Roller blinds come in different kinds of patterns, style, sizes, colours and you will have plenty of choices to choose from. 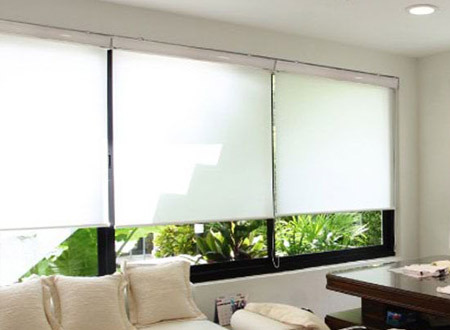 If you are looking for roller blind that is able to block out more sunlight then choose the blackout roller blinds because it is made of thicker material. It is a good option if you want to have privacy and not want people to peep through your windows. Blackout roller blinds are also good to use for nursery room when too much light penetrating into your window can disrupt the baby from sleeping. Book an appointment with the roller blinds contractor today and get a free onsite quotation to see what’s the best solution for your windows!